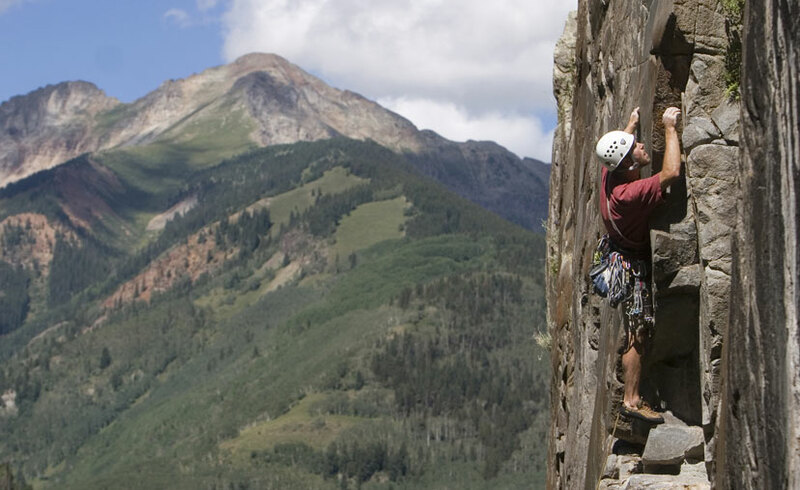 With 58 peaks rising more than 14,000 feet above sea level and hundreds of only slightly shorter ones, Colorado is one of the world’s most popular rock-climbing destinations. The feeling of profound achievement from having scaled one of the state’s legendary peaks, canyons or rock formations can be relived each time you show your friends back home that photo — you, with chalk-covered hands, standing against the azure sky with nothing but rock beneath you. Mountaineering schools and outfitters across the state offer organized excursions and lessons on the basics of alpine trekking, route selection and navigation, and how to use climbing gear. Colorado Mountain School (CMS) is the largest guide service in Colorado. Based in Estes Park, its “classrooms” are the array of peaks and spires that line the corridor between Boulder and Estes Park, including those in Boulder Canyon, Eldorado Canyon and Rocky Mountain National Park. Whether you’re looking for an introductory rock-climbing class, a weekend ski mountaineering lesson or a comprehensive week-long seminar covering ropes skills, crevasse rescues, risk-management strategies and more, CMS can deliver. The Colorado Mountain Club (CMC), founded in 1912, offers numerous classes and seminars throughout the state. At the CMC’s Denver and Boulder chapters, you can sign up for everything from avalanche clinics to basic rock-climbing classes to multiday advanced mountaineering instruction. Paragon Guides offers four- to six-day mountaineering camps in the pristine Eagles Nest Wilderness Area outside of Vail. At this fun and educational camp, ideally situated in the heart of the Gore Range, you’ll learn the fundamentals of mountaineering and rock climbing. Depending on the length of the trip, you may also learn about backcountry navigation, snow travel, basic survival skills, low-impact camping and more. Also in Vail, Apex Mountain School offers learn-to-climb instruction on their beginner to advanced courses, as well as outings in Vail, Beaver Creek, Breckenridge, Boulder and Rifle. San Juan Mountain Guides provides private and group instruction in southwestern Colorado’s magnificent San Juan Mountains. In summer, sign up for an alpine-mountaineering or rock-climbing course and learn how to safely and efficiently navigate the area’s steep and rugged peaks. In winter, discover the thrill of climbing a frozen waterfall in the scenic mountain town of Ouray, known as “the ice climbing capital of the world.” In the introductory ice-climbing courses, beginners learn fundamental techniques (including how to use crampons and ice tools) and practice their newfound skills at the Ouray Ice Park. In the advanced and expert courses, seasoned ice climbers learn how to hone their techniques to accommodate steeper terrain and multipitch environments. Apex Ex in Boulder leads half- and full-day guided climbs for new climbers. Once you get the hang of what you're doing, the guides can take you on longer climbs on some of the Rocky Mountains' most famous surfaces — including the always-photographable Boulder Flatirons, Eldorado Canyon or Rocky Mountain National Park's Longs Peak. To learn more about the heritage of Colorado climbers, visit the American Mountaineering Museum in Golden. Opened in 2008, this impressive museum explores the unique history and culture of mountaineering through its superb exhibits, educational programs, artifacts and lectures. Prepare for your adventure by purchasing a Colorado Outdoor Recreation Search and Rescue Card, which helps reimburse teams that help people who find themselves in need of rescue.